A little over a year ago, I was asked to design and build a desk chair for a new Hard Rock Hotel in Mexico. 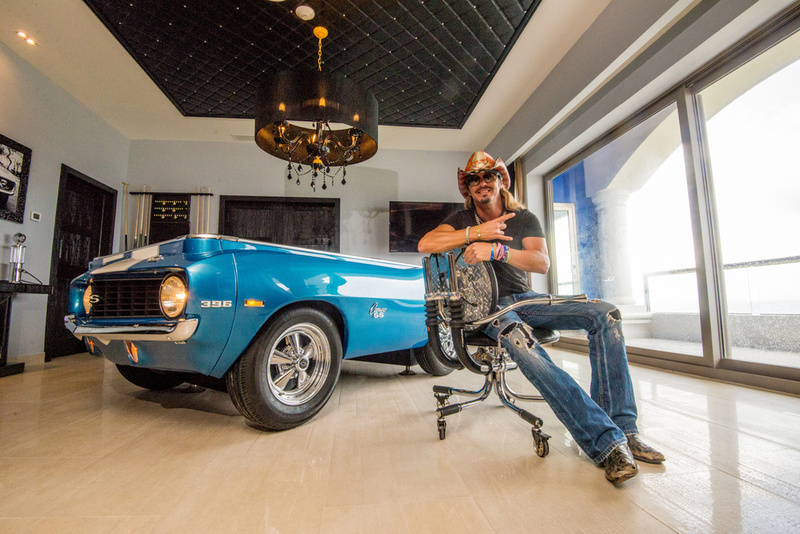 I had the opportunity to hop a plane to Mexico to install some upgraded cushions on 'The Beach Star Roller', and to attend the October 12th unveiling of the Bret Michaels Rock Star Suite at the Hard Rock Hotel, Riviera Maya. It was pretty cool. Read the Event press release. Bret likes his new Beach Star Roller! Itzia, myself, Bret (displaying my card! ), Javier, Alex. Itzia, Javier, and Alex are part of the team responsible for the development of the suite. The traditional smashing of the guitar! This is one of 2 bedrooms in the suite. Since it is where the Beach Star Roller (my chair) resides, I shall call this the Master Bedroom. Music stage in the suite. Nice guitars! Party scene on the deck. On the deck. Very vivid, changing colors. Within 25 minutes after Bret smashed this guitar on the deck, it was put on permanent display downstairs in the suite. Boom! Bike Furniture Design 'Beach Star Roller' chair built for the suite. Oh, and a '69 Camaro pool table. 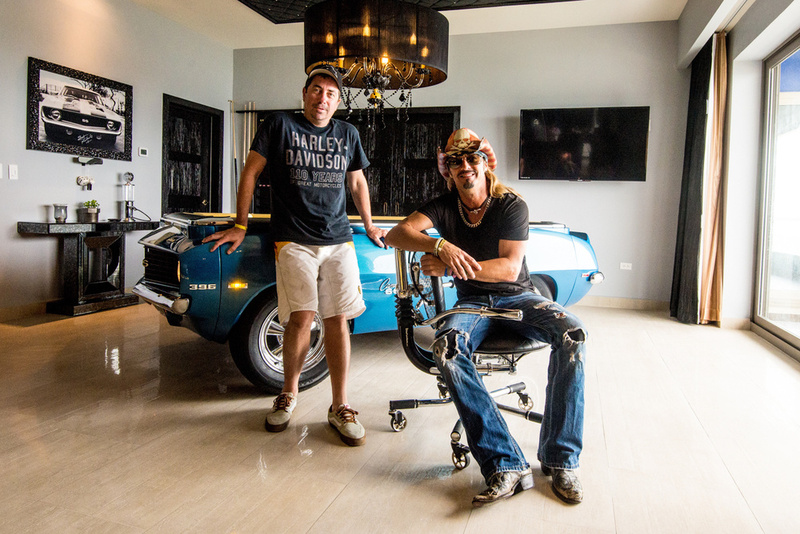 Bret's 'Hollywood Taxi' Harley-Davidson motorcycle and his 'Rose" guitar dominate the entry of the suite. Master Bedroom view with Beach Star Roller Chair. As part of the 'Pinktober' campaign for breast cancer awareness and research, the bed is adorned with pink sheets. 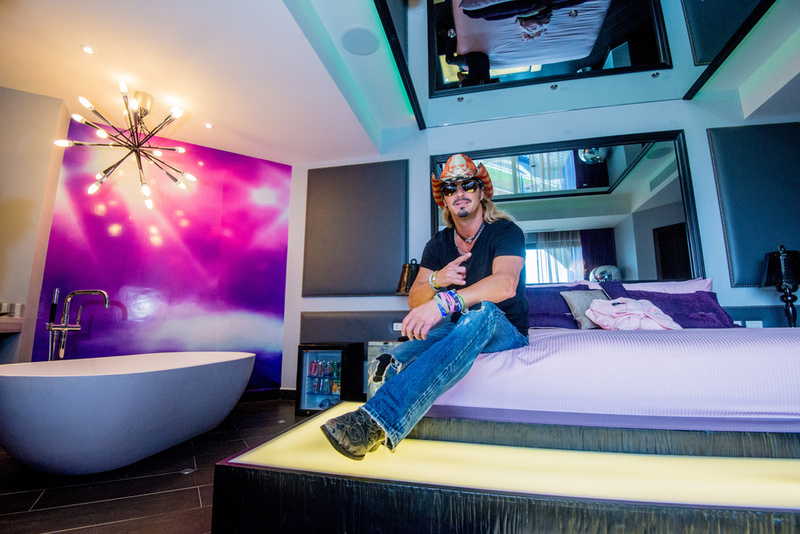 Bret chillin' in the Master Bedroom. As part of the 'Pinktober' campaign for breast cancer awareness and research, the bed is adorned with pink sheets. "From every angle, Session Kitchen is a work of art. 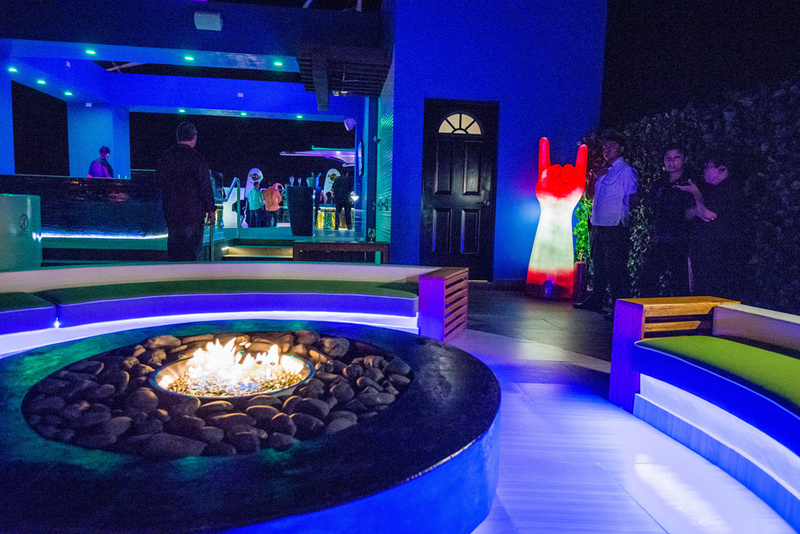 Adorned with graphic murals and intricate installations, this new Denver restaurant will dazzle you the second you walk in the door." October 2013 saw the largest collection of Bike Furniture Design work delivered to the new Sessions Kitchen restaurant in Denver, CO. That place really looks good. The food is mighty tasty, too. The menus are pretty cool, too. They gave me a nice little write up in the menu. 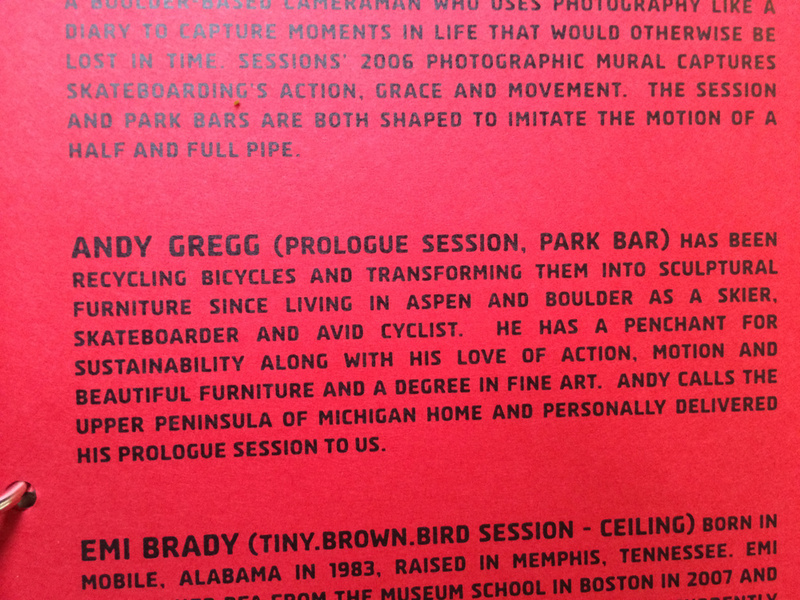 Bike Furniture Design is a design and manufacturing studio specializing in modern furniture made primarily from recycled and upcycled steel, aluminum, and carbon fiber bicycle and motorcycle wheels, handlebars, and frames.